Aug. 22, 1935 — As the fourth day passes without a trace of the four well-known citizens of Fairbanks who disappeared Monday morning while traveling by airplane from Dawson to Fairbanks, search for the lost plane and its occupants is being pursued with increased vigor by Alaska aviators. Official authorization for the search was received today from Gov. John W. Troy. From his headquarters in Juneau, he sent a telegram to United States Commissioner W.N. Growden of Fairbanks directing that Murray Hall, federal aeronautics inspector, be placed in charge of the hunt and advising that territorial funds could be used in prosecuting it. from The Fairbanks Daily News-Miner . Worked in government service in Alaska. Retired to Los Angeles, California. Growden, William N. — of Ruby, Yukon-Koyukuk census area, Alaska. Democrat. Member of Alaska territorial House of Representatives 4th District, 1935-36. Presumed deceased. Burial location unknown. 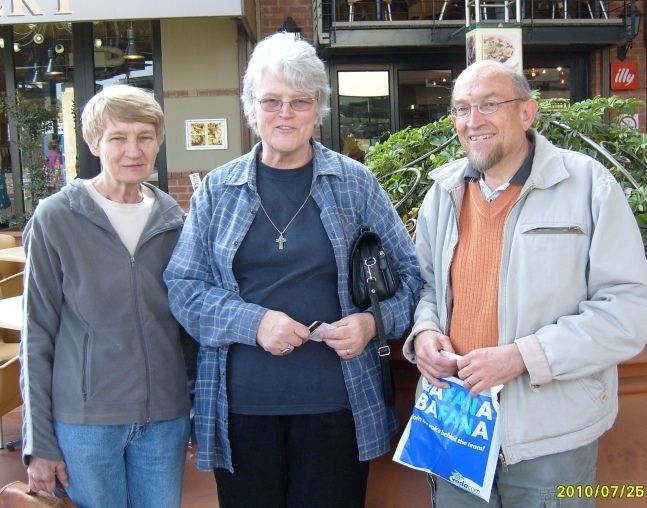 Last month we had a visit from Val’s cousin Enid Ellis and her husband Justin, who were on holiday from Windhoek, Namibia. Val and Enid are cousins on the Pearson side of the family. We manage to see them once every 5 years or so, usually when they are passing through, and catch up with news of family and friends. This time we did it over lunch in Centurion Mall. Val (nee Greene) and Enid (nee Gammage) grew up in Escombe, in Queensburgh, Natal, near Durban and the families were very close, and they spent a lot of time together. Steve met Justin when he came to Windhoek with a group of students from Stellenbosch University to spend part of their summer vac there in 1970. Actually it was a funny summer, as for one week it was bitterly cold, and there was snow in the Cape, in December! Steve and Justin met again in July 1972 (the real winter) at an Anglican Students Federation conference at KwaMagwaza in Zululand. Steve had been deported from Namibia, along with some other church workers, including the bishop, Colin Winter, and so Steve tried to persuade Justin to go there to take the place of some of those who were kicked out. Whether the persuasion did the trick, or whether it was something else, Justin eventually went. A few months after that meeting, Steve met Val and Enid in Queensburgh, and in 1973 Val and Enid went to Namibia on holiday. In 1974 Enid decided to go back there, and later that year Val and Steve were married, and Enid and Justin as well. And a few years later Justin and Enid were deported from Namibia (an insidious habit), and spent a few years in England, returning when Namibia became independent in 1990. Back in the 1970s we were all Anglicans. Now Enid and Justin are Quakers, and Val and Steve are Orthodox. SALINAS, Calif. — A seventh-grader and her 80-year-old grandfather are allegedly the first people to discover that President Barack Obama is related to all other U.S. presidents except one. BridgeAnne d’Avignon, who attends Monte Vista Christian School in Watsonville, traced that Obama, and all other U.S. presidents except Martin Van Buren, are related to John ‘Lackland’ Plantagenet, a king of England and signer of the Magna Carta. BridgeAnne claims that President Obama is her 11th cousin. I wonder what relation he is to the other US presidents.